A fanatical orchid poacher, a brilliant New York journalist and an imaginative writer with writer’s block whose twin brother decides to take up writing too – it’s a recipe for magic in Adaptation. Charlie Kaufman is an Oscar-winning screenwriter but even he has days when his muse goes AWOL. This happened to him in a major way when he accepted the job of writing the screen adaptation of Susan Orlean’s best seller ‘The Orchid Thief’. He just couldn’t do it. 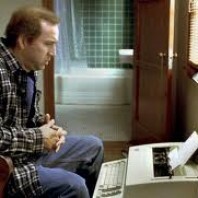 For months on end he struggled with the task, until he decided to write himself, and his dilemma into the script along with a fictional twin named Donald. A dishevelled Nicolas Cage nails it as both the blocked Charlie and his nemesis Donald, who transforms himself into a mainstream screenwriter by taking classes with the famous, real-life writing coach Robert McKee (played by Brian Cox at McKee’s own suggestion). While Donald ploughs ahead with his first script, Charlie descends into an anxious sweaty self-loathing abyss. By contrast, Tilda Swinton is perfectly composed as producer Valerie Thomas who has commissioned Charlie to adapt the book for the screen. And Meryl Streep is luminous as the author Susan Orlean, a journalist with the New Yorker who, in a series of flashbacks, heads off to Florida to meet with her subject John LaRoche, a long-haired feral who poaches rare orchids with the Seminole Indians. Chris Cooper wears a prosthesis to imitate LaRoche’s toothlessness in a fabulous performance that won him a Best Supporting Actor Oscar. Using his renegade charm LaRoche soon finds chinks in Susan’s armour and, with the help of a substance extracted from the rare Ghost Orchid (and a bit of artistic licence), he turns her into a character not dissimilar to Katharine Hepburn’s in The African Queen. This is a wild and wonderful film that explores the very nature of creation itself. Adapting a book about flowers turns out to have parallels with Darwin’s theory of evolution and Kaufman plunges us back to Hollywood 4 billion and 40 years ago to prove it. We journey with him to orchid shows where he compares women with flowers. We visit the set of his previous film Being John Malkovich to find Malkovich and Catherine Keener oblivious to his existence. 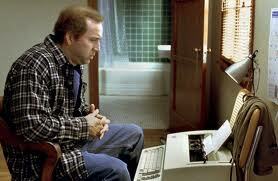 But it was during that shoot that Kaufman was at the peak of his frustration with this script. And it was director Spike Jonze, who also directed this film, who encouraged him to pursue his unusual concept for it. Kaufman says that he wouldn’t have written it had he seriously believed that the studio would make it. Thank heavens he did because it provides us with a rare portal into the mind of a screenwriting genius. He and his fictional, alter ego brother Donald, who’s memory the film is dedicated to, received an Oscar nomination for their work but it would be another two years before Charlie won the award for his next script Eternal Sunshine of the Spotless Mind in 2005. Adaptation tells us to “love what you want, not what loves you”. And it shows us that in both life and art there are no rules.